Small-business owners like Tony Chastenay at All Axis Research & Development LLC know that acquiring new orders is crucial to growing the business. It is also part of building a better life for owners and for the employees who devote so much energy and passion to work on a daily basis. Technology is the company’s competitive weapon to achieving this goal, and Chastenay uses it efficiently for prototype part manufacturing in the electronics, aerospace, glass and industrial printing industries. 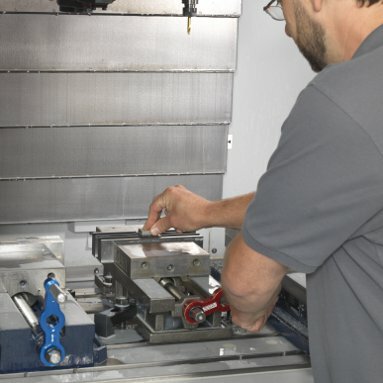 To handle the sheer diversity of materials and parts it works with, All Axis requires flexible and reliable equipment, like its Makino PS95 vertical machining center. This equipment has not only helped All Axis handle this kind of part variety, but it has also reduced cycle times by up to 50 percent over previous equipment, showing customers that the company is committed to completing jobs on time, on budget and with exacting tolerances. Owner Tony Chastenay (center) with development machinists Kevin Aucoin (left) and Chad Summer (right). 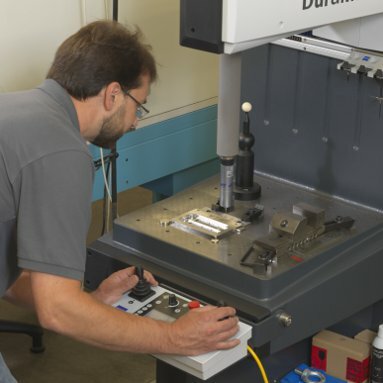 Chastenay has followed his passion for machining since high school; and while he may own his own company now, he still enjoys spending time on the machines. All Axis has transitioned much of its heavy hogging and hard material applications to the PS95, based on the machine’s rigidity, accuracy and overall efficiency. Standard features of the PS95, like the through-spindle coolant and high pressure coolant, help speed up cycle times in milling, drilling and plunging operations. 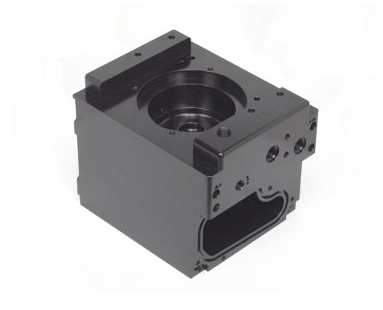 With the improved speed and quality afforded by the PS95, All Axis has been able to decrease costs by 10 percent, passing those savings along to its customers. 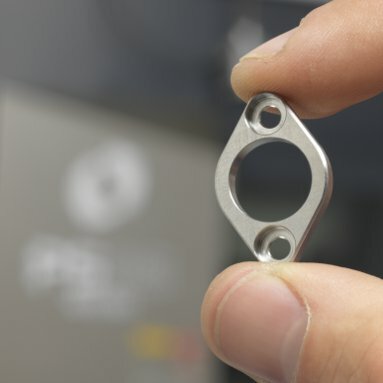 In parts transferred from previous equipment to the PS95, All Axis has seen cycle time reductions from 20 to 50 percent due to fewer machining passes and faster feedrates. The rigidity and precision of the PS95 enable All Axis to handle tight-tolerance holes and slots at plus-or-minus 0.0002 inches with great repeatability. Ever since high school, Chastenay has enjoyed machining and working jobs where he was able to use his hands. He has always been good at tinkering with cars, trucks and other heavy equipment. A trade class in high school piqued his interest early on and drove him to excel in this type of career. After high school, Chastenay worked at a few local companies, including an aerospace manufacturer that handled many exotic metals. When a friend recommended an open development position at another company, Chastenay found himself eager for the challenge. He started working as an experimental machinist and gradually moved up to supervisor and then into a management position. When the company decided to discontinue its experimental machine shop, Chastenay saw a new opportunity. There was continuing demand in the market for prototype part manufacturing, and he already had a Bridgeport machine at home for performing side jobs. Chastenay decided to go into business for himself at All Axis. He had the blessing of and encouragement from his former employer, and he qualified Chastenay’s business as a vendor before Chastenay even left the company. 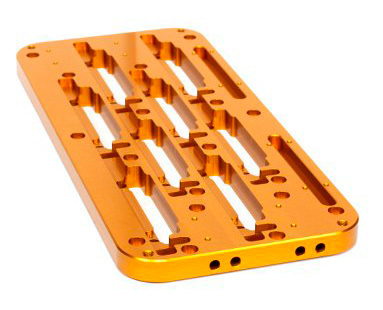 At All Axis, Chastenay handles engineering and proves out products. The company creates prototypes for some businesses and often manages bigger runs. 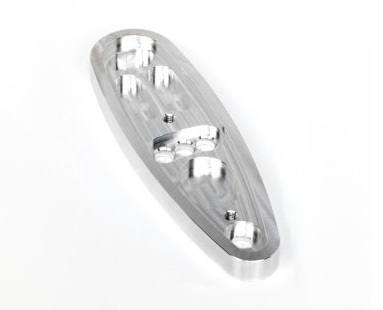 The company also makes fixtures for the parts it is designing. The work at All Axis has continued to evolve as Chastenay and his colleagues learn more about the capabilities of their equipment. 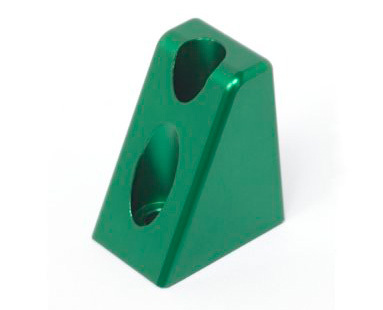 With prototype part manufacturing, batch sizes are typically small with quantities of 10 or less. As such, All Axis found itself performing a lot of setups and programming. Running its existing equipment nonstop meant that All Axis didn’t have a moment for downtime. The company was afraid that if it lost a machine, there would be no backup, it could lose a customer, or that the loss in profit would be more than the machine itself. Moreover, it was already experiencing some reliability issues with its previous equipment. Chastenay had some familiarity with the Makino name and the machine’s Fanuc-based control. Then, at IMTS 2012, he also saw a demonstration of the PS95 cutting steel. 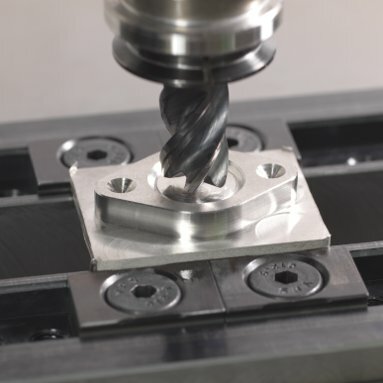 While All Axis had never worked with Makino distributor Able Machine Tool Sales before, it had received good recommendations about them from other shops. Chastenay also saw the PS95 in action at one of these businesses. All Axis purchased the PS95 in December 2013. The machine has since exceeded the company’s requirements for productivity, quality and efficiency. “After installation, we found that all the details that Makino and Able Machine Tool Sales had provided us about the machine prior to installation were 100 percent accurate,” Chastenay said. “I believe that you get what you pay for. The machine is very efficient and user-friendly. All Axis appreciates the through-spindle coolant and the chip conveyor features that it didn’t have on previous machines, all of which comes standard on the PS95 machine. “We find it very efficient to not have to remove chips from the machine,” said Chastenay. “We used to shovel enough to fill a 55-gallon drum on each part. With the PS95, we are not shoveling chips. We are instead making chips. Features like the through-spindle coolant speeds up cycle times on milling, drilling and plunging. On pecking operations, we can now complete these features in one clean Z-axis plunge. The PS95 is the fastest machine in the shop. Machine utilization is up, and we’re able to be more competitive. Another area where the company is saving time is by consolidating setups by using progressive fixturing. In addition, the larger work envelope and travel of the machine compared to the previous machine have enabled All Axis to take on larger part applications and to perform multiple operations in a single load for faster completion of parts. All Axis also appreciates that the PS95 follows the geometry it is programmed to, with less tool deflection and better blends. All Axis is also pleased with the quality coming off the PS95. The results seen on the PS95 have brought in more orders. The machine has also made the company more competitive, which is reflected in its part costs. Chastenay explained, “By reducing our cycle times and achieving better quality, we are able to pass along savings gained from those efficiencies to the customer. In fact, on parts transferred to the PS95, we have had a 10 percent decrease in cost. We are now bidding on jobs that we couldn’t previously, and customers who once passed on our services are now coming back to us. All Axis sees high-performance technology as the future of the company and has plans to continue to replace older equipment with another PS95. It is also considering an expansion of its capabilities with the addition of a 4th- or 5th-axis table. “We believe that technology puts us on top,” said Chastenay. “This equipment arms us with the recipe to be the best. We want our existing customers to know that their business is important to us. We are demonstrating that by building a reliable business where people feel confident when working with us. We take our customers seriously and aim to serve them well, delivering what they ask for and more.